Custom Gutters are the perfect way to create an ambience to coexist with a certain design pattern for your residential or commercial project. When customizing a gutter, you may want to opt for a seamless system. In a seamless system, the flow is unimpeded by splices, creating a straighter shot to the downspout for water and debris. Although you will still need to clean your gutters, if you’re in your “low maintenance” stage of life, choose seamless gutters — they require less recaulking and upkeep over the years. A Custom Gutter carries the essential functionality of a regular gutter system with the addition of an individualized appearanace. It’s a unique way to spice up the roof of any job. All gutters are either sectional or seamless (or continuous). 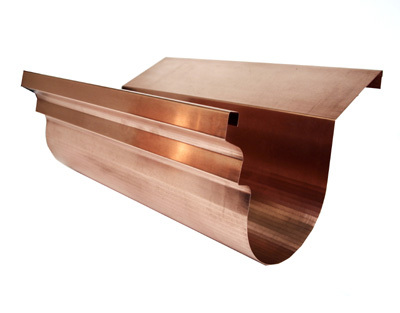 Sectional gutters are sold in pieces and installed as component systems. The sections themselves can be over 20 ft. long each or cut to any size with a hacksaw. Snap-in-place connectors join gutter sections to each other and to downspouts. All sectional systems have end caps, corner pieces and drop outlets for connecting to downspouts. The drawback to sectional systems is that all those seams can eventually invite leaks. Seamless gutters won’t leak at seams because there are none; sections join only at inside and outside corners and at downspout outlets. That’s why they’re the most popular configuration. Seamless gutters, made of aluminum, galvanized steel or copper, are extruded to custom lengths on site using a portable machine.